The STV website reports that South Lanarkshire Wheelchair Curling Club marked St Andrew's Day (November 30) with a haggis curling competition. The huge haggis, donated by sponsors Damn Delicious of Lanark. was used as the target in the competition that drew over 30 curlers to the Hamilton Ice Rink. 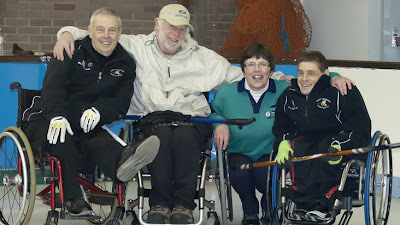 South Lanarkshire Wheelchair Curling Club chairman Arthur Bell described the day as "filled with lots of skill, sometimes a bit of luck as the beastie was whacked away, and always lots of fun. That's what amateur sport should be about."